The 'Construction Equipment Operator' commonly operates heavy equipment and machinery that are found in today's construction industry. 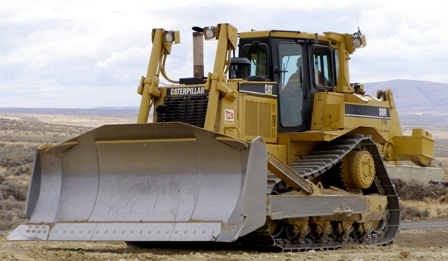 An example of the types' equipment operated includes, but is not limited to, bulldozers, track type and rubber tired backhoes, rubber tire loaders, motor graders, scrapers, rollers, forklifts, GPS and laser controlled equipment and the operation of automatic machine control. The 'Hoisting Engineer' commonly operates the various large types of cranes that are found in today's construction industry. An example of the type of training that a 'Hoisting Engineer' receives includes, but is not limited to, rigging the load, signaling the load, pre-operational checks, operating the crane, inspecting the crane, maintaining the crane and repairing the crane. The GPS/ Grade checking Program is vital to all those who work on heavy highway and site development construction projects. The course was specifically designed to introduce the Understanding of Grade Stakes, the Principles and the Responsibilities of the Grade Checker. The course also introduces the latest in innovative and advanced grade technology such as GPS, Lasers, Laser masts, Automatic Machine Control, Sonar Tracers, Lenker Rods,, Laser receivers, data Collectors and Earthwork Estimating Systems. The history of Grade Checking from past to present is reviewed along with the basic principles of Grade Checking. A 'Heavy Duty Mechanic Repair Person' commonly performs maintenance and repair on various kinds and pieces of heavy equipment. An example includes, but is not limited to, greasing and oiling, minor adjustments, repair of engine braking systems and trouble shooting, standard transmissions, instrument panels and automatic machine control applications and installations, as well as calibrations.